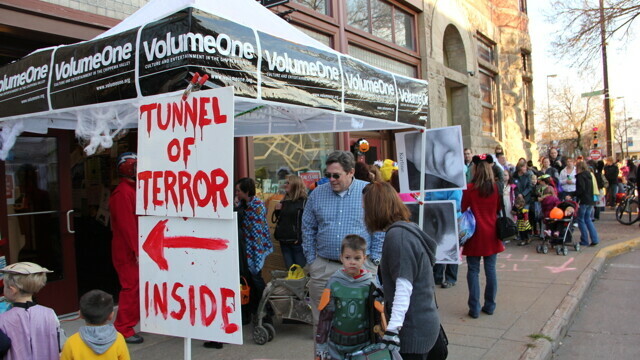 It is with a heavy (fake-blood-covered) heart that I report Volume One will not be hosting our famed “Tunnel of Terror” during this year’s downtown trick or treating event (Wednesday, Oct 31 from 3-5pm). The obvious reason for this is that we’re two blocks off Barstow Street now and thus a bit out of the festive fray, but don’t rule us out for some kind of downtown Halloween shenanigans in the future. Rest assured, however, that instead our efforts are going into some great things for the holiday season at The Local Store and Volume One Gallery. We’re currently in that weird retail phase where all you think about throughout October is holiday decorating, holiday gifts, and holiday happenings. And there will be a LOT happening. It’s all still under wraps, but know you’re going to need to put some things on your calendar soon. Find the new Local Store Facebook page to stay in the loop. In the meantime, Happy Halloweening to all you crazy kids out there.